What a surprising thing blogging has been to me. Last year at this time, if somebody asked me what a blog was...I would have just given a shrug...the kind that includes raised eyebrows and wide eyes. I had just begun to see the term around, but hadn't yet sit down to investigate what it was all about. I'm sure I probably started by googling the word blog...and wouldja look at me now. Here I am, sitting in front of my computer, trying to put together one last post of the year. A post with my favorite meal...or food...or maybe flavor...whatever it is, it's my absolute favorite above all others...this year or any year. I started making mole about 10 years ago. Actually, I think it was exactly 10 years ago this holiday season! 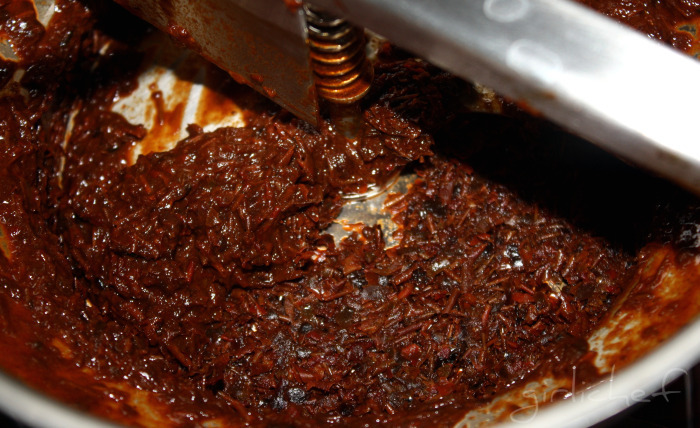 Did you know that red molé is actually the national dish of Mexico? Even though, it is actually a sauce. 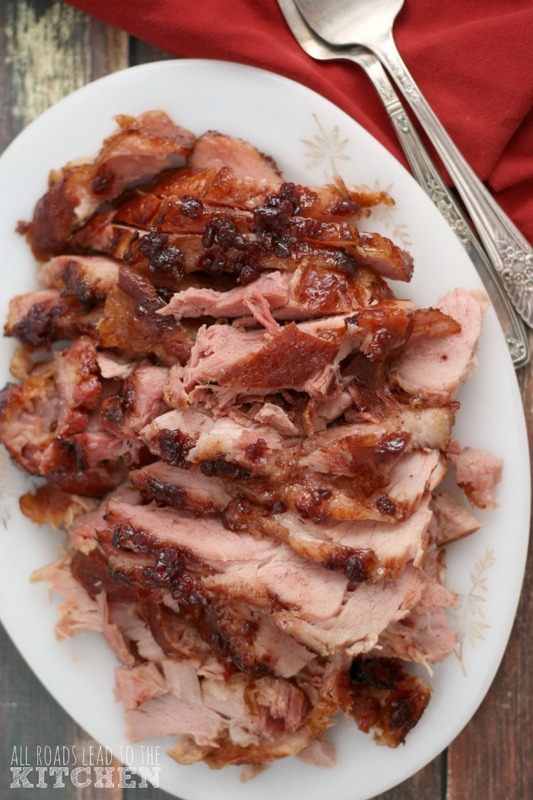 A sauce, that is delicious with anything from poultry to carnitas to vegetables! And in Mexico, families (and family members) each have their own special molé ingredients and proportions. In ritual, they gather the most beautiful dried chiles...the kind that are still pliable...spices, dried nuts and fruits...and another star (usually homemade, too), Mexican chocolate. 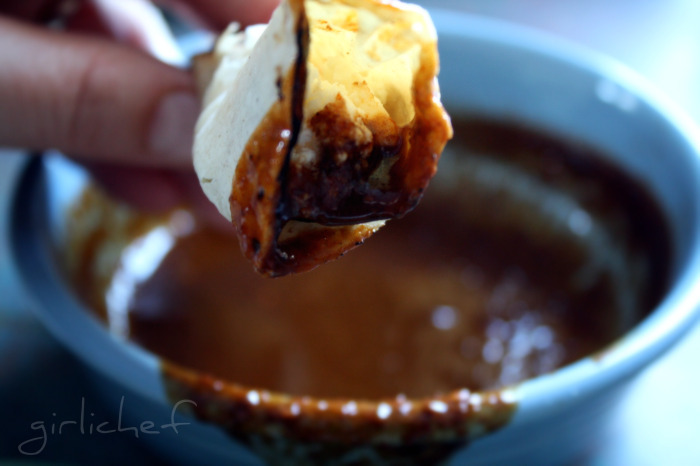 Yes, this is the sauce that some people call the "chile and chocolate sauce." But don't let that fool you, because it is SOOOOOO much more. 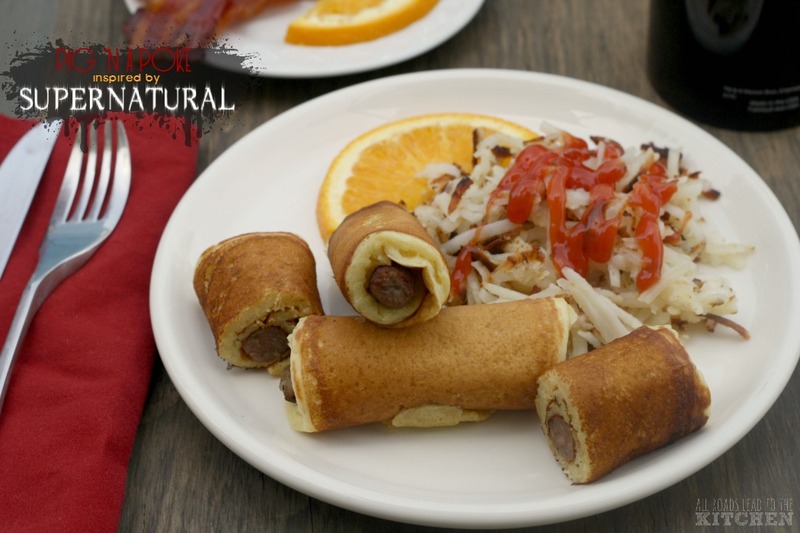 Yes, they both add to the fabulous, earthen complexity of the sauce...but they are not alone. Look for dried chiles that are supple and pliable...you want them to bend. You want the warm smell to envelope you when you get near them. If they are hard and brittle...and you can't smell them...then why use them? I am fortunate enough to have homemade Mexican chocolate from a friends mami in Mexico, but the kind you can find at the market are very, very close in quality. Plump tomatillos and sticky raisins...thick bread...and the nuttiness of almonds and sesame seeds are more of the ingredients in this mole. Round it out with some piloncillo (or brown sugar if you can't find any) and some warm spices (freshly ground in w/ a mortar & pestle or in a spice grinder) and you're on your way. Molé takes a good day to make correctly. And you want to make it correctly! It'll show. I originally learned from the master and have tweaked and adapted over the years in order to make this molé mine, but I owe so much to Rick Bayless and his welcoming, instructional method of teaching through both his books and his tv show. Make your first batch from a trusted recipe, and then adapt from there. Mexicans themselves ask me how I learned to make this. They swoon just as much as I do. Just as the hubs...otherwise referred to as mexi...he'll tell you it's true. I can't even tell you the number of times I've been told... "You can get married now!" Good to know ;) This is what they tell a girl/woman in Mexico once she can truly cook. Well. But, any occasion is a special occasion if you add mole...so, I'm adding mole to this New Year's Eve. Begin by gathering your mise en place...you'll be glad you did. Seed & stem your chiles...wipe 'em free of any loose dirt if necessary. Husk your tomatillos and rinse them. Toast your sesame seeds and grind them. Peel your garlic cloves, darkly toast your bread, and measure out all of your other ingredients. This is going to take either one very large pot or two pretty large ones (I usually use two 5-quart pots). Just start everything in one pot and do the dividing once you have the puree made. Also, go ahead and roast your tomatillos under the broiler until blackened and soft. Add those to a large bowl with the ground sesame seeds. Next, heat your oil in the pot and quickly fry your cleaned chiles, in batches. It'll only take ~20-30 seconds total per batch. Remove them to a separate large bowl. Once they are all fried, cover with hot tap water and cover with a plate (to submerge them). Let sit to "plump" for ~30 minutes. Make sure to remove any stray seeds from the oil. In the same hot oil, fry the garlic cloves and almonds until they both turn golden and smell out of this world. 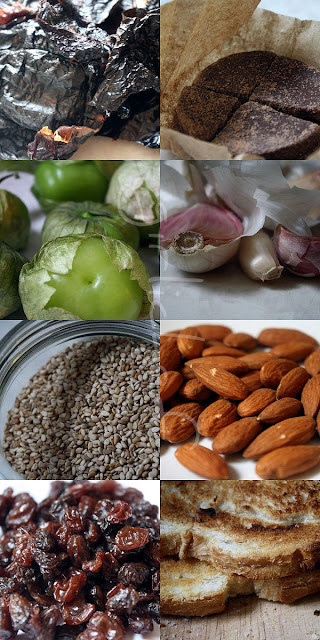 Remove them to the bowl with the tomatillos and sesame seeds. Add the raisins and sauté until they plump up...and they will puff right up, it's pretty cool to watch. Remove them to the tomatillo bowl. Add the toast, chocolate (broken up a bit) and ground spices to the bowl with the tomatillos. 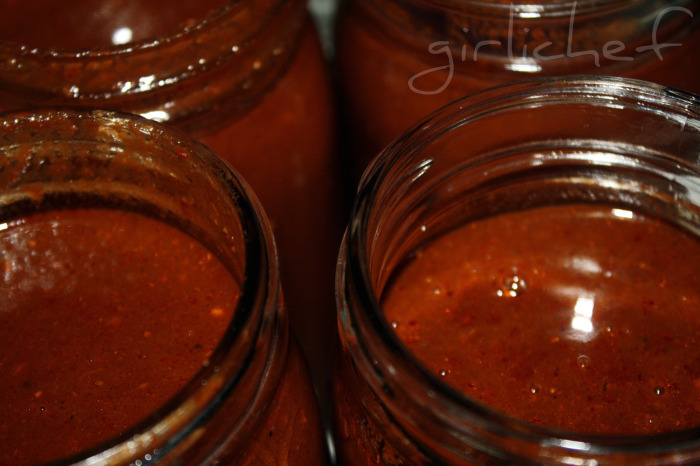 Transfer the chiles to a blender (in batches) and add a total of 5-6 c. of the soaking liquid to help them blend up. Transfer to a food mill, set over a bowl and turn the mill to release all of the liquid and leave the skins behind. I did this for years actually pushing through a strainer...it worked, but I'd be sweating by the time I was done...a food mill is a breeze! At this point, turn the heat back on under your pot(s). They should still have a thin coat of oil on the bottom, if not, add a little. Once it is really hot, add the chile puree and lower heat a bit...cook down until it is the consistency of tomato paste, ~15 minutes. Watch out! This splatters like crazy! And it's messy. Very, very messy. While this is going on, add the contents of the tomatillo bowl (in batches) to your blender (no need to clean jar) along with a couple cups of water, as needed. Once it is all ground up, pass it through the food mill, back into the bowl. Add this puree to the pot once the chiles have cooked down. Stir & let cook back down to the consistency of tomato paste, ~10 minutes more. I recommend grease splatter-guards or a face mask to guard from splatters. Add 3 quarts of water to the pot(s) and bring to a boil. Partially cover and lower to a gentle simmer. Simmer for ~1 hour, or until thick enough to coat the back of a spoon (napé). You can always thin it out with a little water if necessary. Add the piloncillo and ~3 tsp. of salt. Taste...it should be spicy and slightly sweet and earthy and rich...and perfectly silky...all at the same time. Adjust seasoning as necessary. I let it cool down and then transfer to jars or containers for storing or sharing. But, if you want to know my honest to goodness favorite way to eat mole...it is basically, as is. I toast some tortillas and stuff them with queso fresco &/or avocado slices, then dip them in hot molé. It is sheer ecstasy!!! Another surprise...all of the amazing people I've met out here in blog-land!! I am so happy to have met and worked with so many wonderful souls...and to have made some genuine friends along the way. Thank you for such an amazing first year here in the world of blogging. I wish you all a safe, healthy and blessed New Year!! Blogland is certainly a great place to live! Your mole looks wonderful. 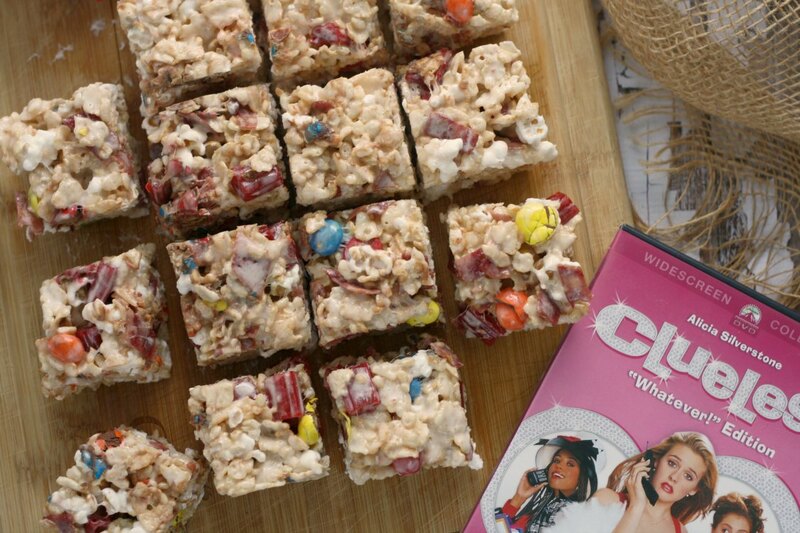 I've always wanted to make it but I freak out at the list of ingredients. The garlic and cinnamon are about the only things I already have in my pantry! Happy New Year! Wishing you the finest of years...2010 is surely to be spectacular! Happy New Year to you!!! I am a real newbie at blogging and I can't even begin to describe the world that blogging has opened up for me-Amazing. You were one of the first bloggers to assist me and befriend me soon after I hit "enter". Thank you!!!! It meant a lot to me. I am looking forward to all your blog posts next year. P.S. 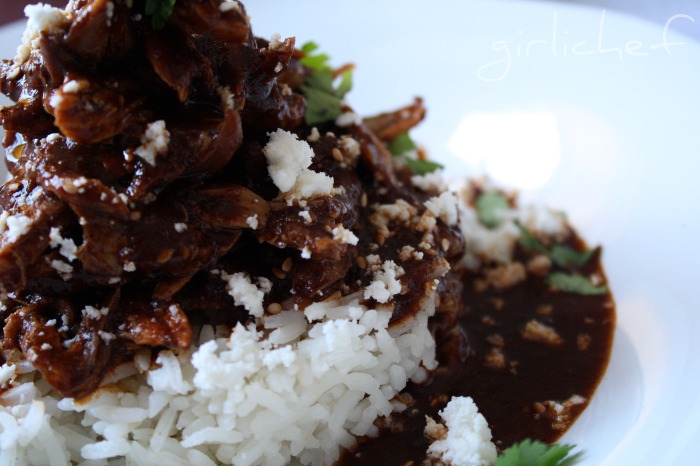 I love mole and Rick Bayless but, never have had the courage to prepare mole. Cheers to you! HAPPY NEW YEAR - what a delicious looking mole - I would love to dunk a hot tortilla into that tastiness! Happy New Year to you! Enjoy your mole' as you celebrate. It looks, sounds and "smells" delicious! I, too, am pleasantly surprised at what the blogosphere has brought to me. It's amazing, isn't it? Salud! I love the picture of you circa 1995!! I hear ya about blogging. What in the world did I do before it? Now I can't imagine a life without it!! It's become such a huge hobby and I've met so many great foodie friends!! I've never had mole, but I'd love to try yours. It looks delicious served with chicken over rice. Great post for the last day of the year! Have a delicious New Year!! 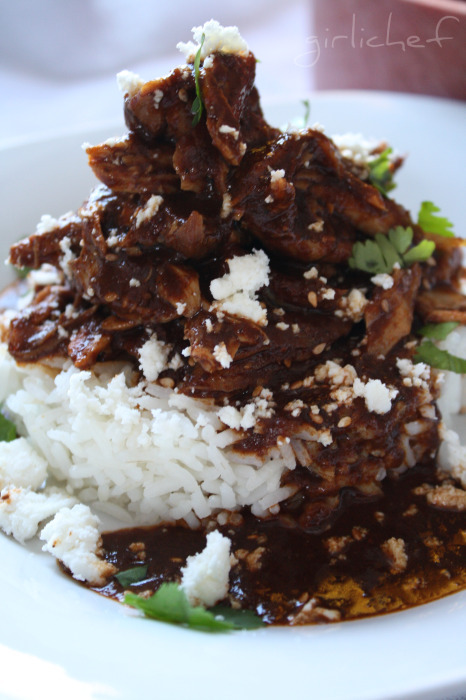 Your mole sauce is outrageously tasty - much better than what I usually come up with so will bookmark. Happy New Year and may all good things come to you and yours. Yikes, I've been blogging for so long that I can't even remember when I started! Maybe as long as 7 or 8 years ago! Crazy isn't it? Wonderful recipe! Happy New Year to you and yours!!! Hello Sweetie,u know what u brought out my feelings about blogging and i had written a little too about how blogging changed my life and how i discovered it more outa curiosity than anything when i didn have a computer but did all my browsing on a cell phone. And u know what we have a "mol" out here in goa too andi make it often coz i simply love it and the absolutely traditional way. Its a pickle but i would so so so love to try urs and belive me there are a lot many similarities between our 2 'mols'. I've had mole but have never made it myself. My grandma does't like it so she never made it. I never knew all the goodies that went into it. Your collage of the ingredients is gorgeous. This mole sauce looks amazing! I'm so glad to have found your blog, and I enjoy reading it immensely! I think I'd better sent out the Best Wishes to you and your family before the internet is gone. Oh man, it's the New Year and my internet connection behaves crazily. Could it be the reason I didn't eat the grapes??? Happy New Year to you too and best wishes always! Happy new year. Darling photo from '95. Welcome to 2010 Heather. It is so full of possibilities. Can't wait to see what is in store for GC.Mole is one of those dishes I would love to learn to make in a mountain retreat ourside of Mexico City. All my best wishes to you and yours. Have a wonderful and happy 2010. This does sound like a WOW!!! "You can get married now..." that is so cute! Wishing you a happy 2010. Looking forward to more of your delicious recipes and photography. 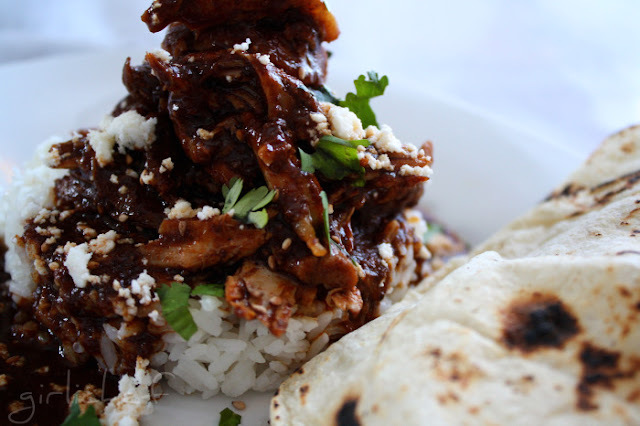 There is truly nothing better than a good mole. It is by far one of my favorite Mexican dishes. 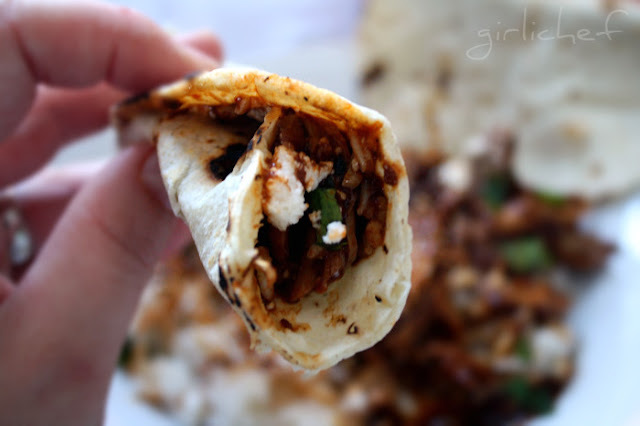 This is definitely on my list of dishes to make in 2010. Thanks so much for the tutorial. Happy New Year to you Heather! It's been awesome getting to know you and I can't wait to share 2010 with you. you cute thing you... I just saw a TV show with Mole' as a dish, and i was wondering what was involved (they spent the entire episode making it, but never showed the ingredients. 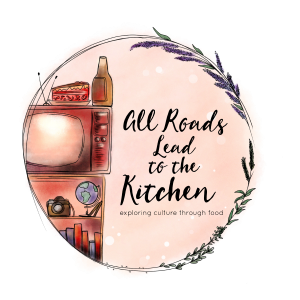 It has been a great blogging year! Oh I am so going to O'D on some good Mexican when I head that way, sounds like a good theme for a Robert Rodriguez Zombie movie, ha! I'm with you on the blog thing. Last January I was clueless about them as well. It's been a fun ride hasn't it?! 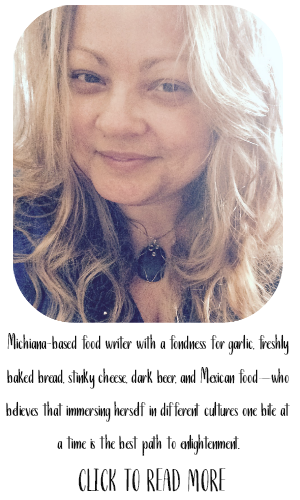 I love your blog and look forward to so many more great recipes! oh wow this sauce looks amazing!!!!! First, I wanted to say Happy New year, and thank you for dropping in to my kitchen. Now-- about this recipe. I don't make enough recipes to please the Mexican side of my D.N.A! I am starting a list of things I simply must learn how to make-- and mole' is one of them! What a great tutorial and gorgeous pics! I'm licking my chops, just thinking of all the fabulous flavors. I'd eat this just the way you do! Second, love the historic picture :) How cute! Third and finally, I have NEVER made a mole' but damn that is something I WILL make before 2011. Great post. Love the photo! I love Mexican food and mole is a delicious sauce. That recipe sounds delicious. Happy new year! Mole has scared me to death, you have it completely handled. Amazing! Love your picture, you're darling! I love mole but never had the guts to do it myself. Great Recipe!! Some of my Mexican introduced me to mole and I can really taste the blend of ingredients... Unfortunately, some of the ingredients are not sold in Montreal. Wow, your mole looks so fabulous and authentic - yum! Happy New Year! Happy New Year! Gorgeous mole--one of these days I am really going to have to learn to make it. ;-) Have a fantastic 2010! Happy New Year and have a terrific 2010! 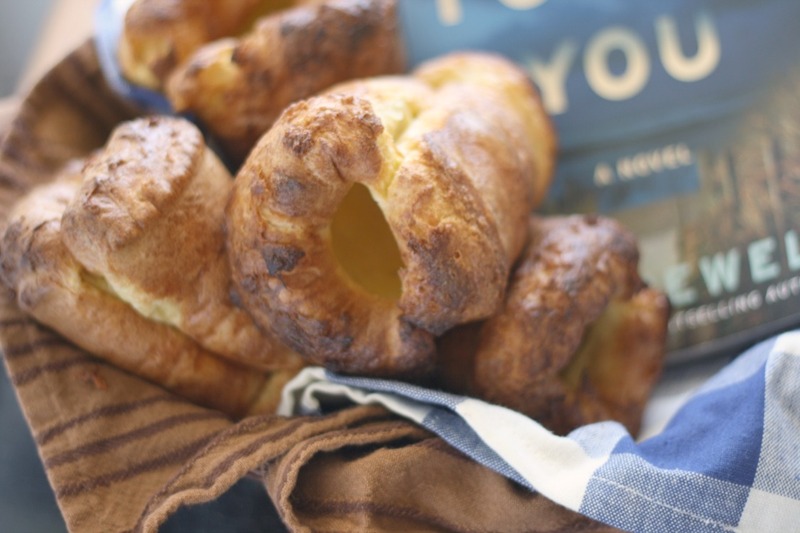 Wonderful recipe and GREAT blog post! I definitely want to try and make mole SO thanks for sharing! I REALLY enjoyed that post! I have had mole in restaurants but never thoought about how to duplicate it. Also love that photo you posted. I've only had it once and boy was it yummy! Now this is on my to do list!! How beautiful and deep this looks :D Must be wonderful on the tamales! Mole (sorry, I have no idea how to get the little accent mark over the 'e') always brings to mind my ex-fiance. He loved mole, especially over chicken. So thank you for giving me someone else to think of when mole comes to mind. Goddess knows I don't want to think about PAUL. Okay, enough of my garbled comment. p.s. 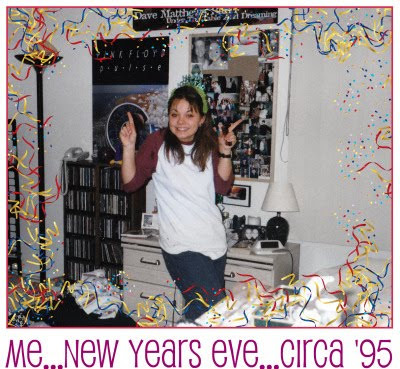 You were rocking '95! Love mole, it is so personal with each maker! This sounds wonderful girli and I can't wait to make it. Thanks so much.